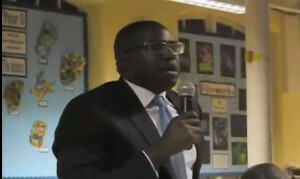 The speakers were David Lammy MP, Christine Blower from the NUT, Alasdair Smith from the Anti Academies Alliance and Fiona Millar from the Local Schools Network. The contribution was from Susan Gerrad, a parent at Noel Park primary, another Haringey school under threat. I agree that she was great. I have just listened to the Woman’s Hour discussion. Well done Downhills for your contribution. However, the pro academy speaker was allowed to make claims without challenge. He came from Omiston Victory Academy, which replaced Costessy, and has, so far, only reported one set of exam results (which were, of course, the result of 4 years of Costessy and only 1 year of Ormiston). He did not mention that year on year the exam results at Costessy had been improving (although with a dip in its final year, possibly as a result of the changeover). He did not mention that Costessy’s CVA was average and that other Ormiston academies had much lower Ebacc results, indicating possibly use of vocational courses to boost results. It will be interesting to compare their results fully when they come out at the end of the month. The meeting included those who only oppose FORCED academies, and those, like me, who oppose academies full stop (listen to the audience debate video for excellent arguments against academies) … but we were all UNITED in opposing this forced academy. As one speaker said in the audience deabte, if we can win on this, we can win on SO MANY things! I agree with all the speakers, which exposes the lies of this Con-Dem Coalition. Education should not be taken out of the control of local education authorities, the schools that are struggling should have extra funding and support, as many are in socially deprived areas! School Academies are run for profit by private companies, and don’t have the interest of providing high quality education for pupils and good working conditions for staff! Brilliant meeting which exposed Gove’s ideology, which is not about parental choice when the parents disagree with him! PS the number of people was at least 700, with over 200 standing. I couldn’t agree more with all the speakers. We need to make sure we don’t forget what the effect of this fight does and will have on our children: At the end of this week I will have to explain to my daughter why 2 of her closest friends will not be with her at school on Monday — because Michael Gove has succeeded in frightening off their parents.